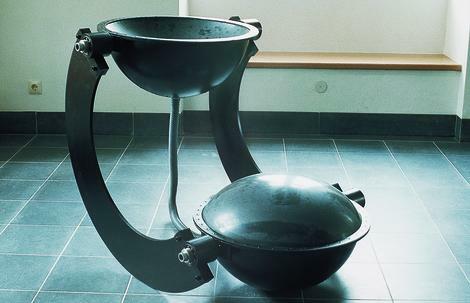 Two hemispheres suspended by universal joints are bolted together by two semi-circular steel segments to form a system similar to scales. By means of bolted-on rubber membranes they each form a flexible contain-er. The two containers are connected by a hose. The container system is horizontally aligned, filled with water and closed. Caused by only slight differences in height, the water begins to flow into the lower of the two containers. During this process, a migration of volume takes place within the sculpture. As a result of the vacuum produced in the container located at a higher level, its membrane arches inward concavely, while at the same time the membrane of the container sinking lower and lower is pressed outwards. This motion sequence is only stopped when the lower container makes contact with the ground.